Rider Education Riding Calendar Join Now! Let the New Year begin! The membership meeting and awards ceremony was the perfect way to start the SEDRA ride season! I arrived at 5 Friday evening to start getting our room set up for the Saturday shin-dig. 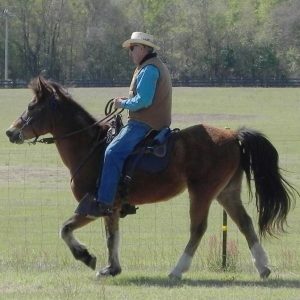 I was met by Wayne who assists with the care taking of the Black Prong Equestrian Facility. He explained there is no air conditioning, BUT the repairman would be out in the morning to work on the unit. Keep fingers crossed he can fix but until then, keep the fans running and doors open. We may not have AC in 90+ degree Florida weather? Lovely. 8AM Saturday the repairman was there and by 10:15 and some creative wiring, he had the unit working. Hallelujah! Members, so many members, started to arrive for the 1st seminar scheduled for 10:15. 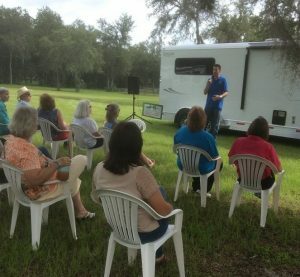 Shawn with J & S Trailer Service from Ocala gave an informative seminar on trailer maintenance focusing on tires and batteries. Shawn took plenty of questions from the crowd and was a real source of knowledge. Summertime is the perfect time to have your annual maintenance performed so you are ready for the competition year when it begins. Be sure to visit J & S Trailer Service for your next trailer checkup! Next was Stephanie McLean of Purina. 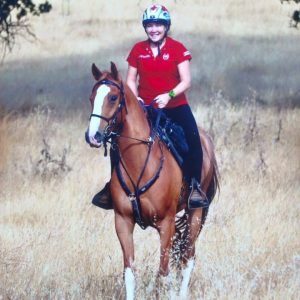 Stephanie has been with Purina for 25 years and spent time in California working with endurance horses and Susan Garlinghouse, DVM. Her power point presentation on Gastric Distress in Horses was well received with lots of participation from the audience. This brought us into our FREE lunch sponsored by Purina and Hoof Boss. Members brought side salads, cookies, chips, and cakes to accompany the meats, cheeses and relish trays provided by our sponsors. No one went hungry! And how many people may that have been? How about 40 PLUS!!! When planning speakers and lunch and setting up the room and all the things that go hand in hand with having a successful meeting/banquet, one does fret just a little and prays A LOT that more than 10-15 people show up. Thank you to EVERYONE for the support. I sincerely mean that. Our membership meeting started a tad after 2 PM with a FULL HOUSE. It was so nice to see so many members in the audience. We stayed on track with the agenda however this President tends to talk way too much. I have so many stories, thoughts and reminders. 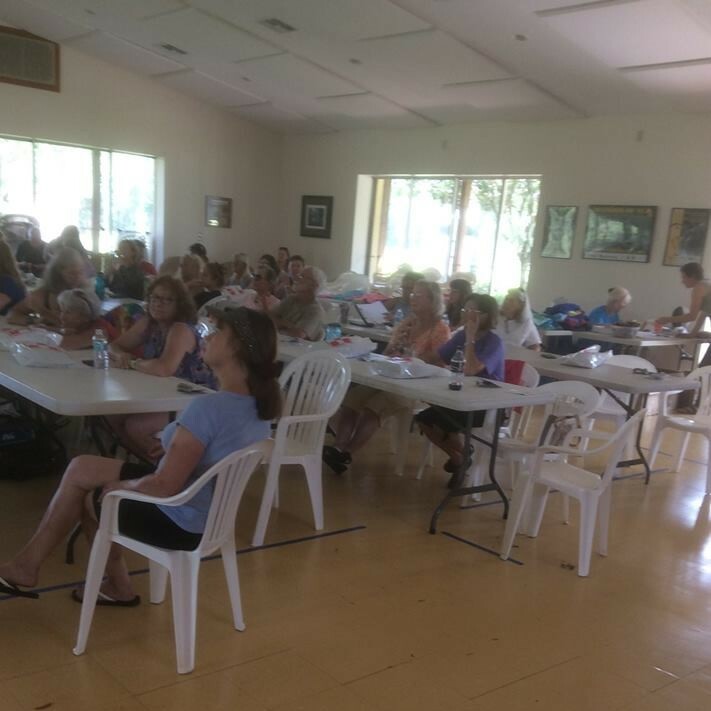 I shared the experience our 2018-19 board members have when it comes to distance riding and equestrian sports in general. I believe our membership should know that we have experienced like minded people serving on the board. We also have a few board members that don’t have lots of zeros behind their competition miles however, they bring enthusiasm and fresh ideas to the table. At 4 pm we headed into my favorite part of the day… AWARDS!!!!! So many awards. So many deserving riders and horses. I love playing “Vanna” with the help of Lindsay Campbell. We have a great time although at times we are not a “well oiled machine”. We’ll improve on that for next year. I also love when members come up to receive their 1st 250 mile pin and then the looks on people faces when we hand out triple 000 mileage stickers. 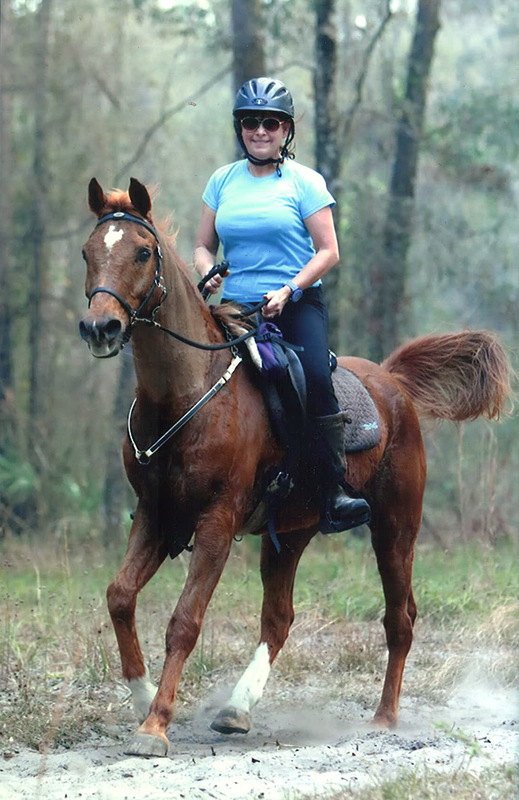 Cheryl Van Deusen may very well be our 1st 50,000 mile rider if she continues to ride, really ride! Congratulations to all our award winners! We’re proud of your accomplishments! All award recipients can be located in our membership directory. Renew your membership TODAY ! 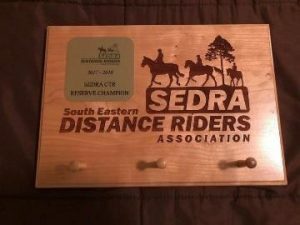 SEDRA not only presents awards for rider mileage accomplishments, we also present awards for your horses’ mileage accomplishments. Make sure you register your horse for their miles too! A HUGE thank you to Gayle King and Jodie Moore for their beautiful work on our special awards. BOD MEETING – Our first Board of Directors meeting will be held July 29 at Shelley Scott Jones home. All members are invited to participate. The first meeting we’ll finish up any loose ends from the previous year followed by new business for the upcoming year. Please contact me if you would like to attend so I can give you the time and address information. If you have an idea or suggestion but can’t make the meeting, email it to me. I’ll present on your behalf. RIDES – Our ride calendar is filling up! The Iron Mountain Challenge starts our competition year August 24-25. I hear it is a beautiful ride with camping next to the river. Challenging trails that are well marked, great food and lots of good cheer spread through out the weekend. The AERC National Championship on the beautiful Biltmore grounds is September 20 through the 22nd. Congratulations to everyone who reached the criteria to compete. Good luck! Scenic Spruce Creek is back October 20 and 21. 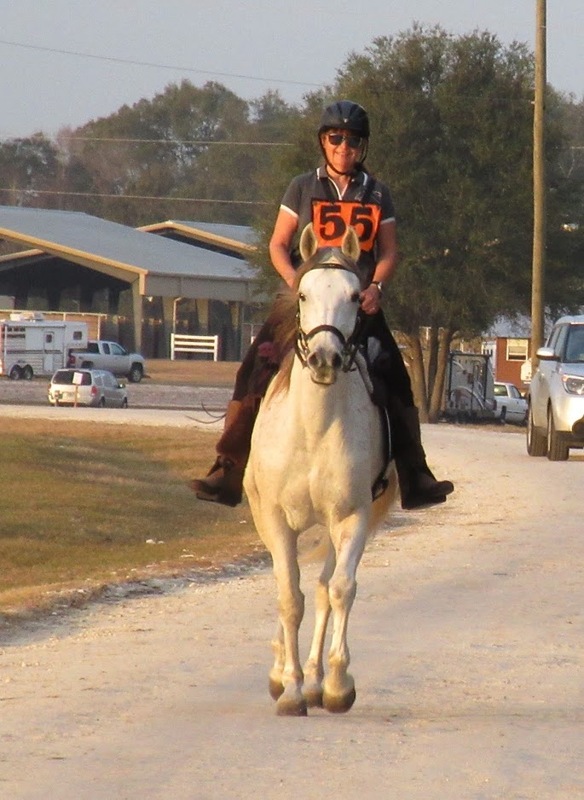 Day one is an endurance ride with day 2 a CTR. October should be a lovely time of year for this ride. FHA Clinic, our first clinic of the year follows on October 27 and 28th. FHA and Doug Shearer will be hosting the clinic on day 1. New to distance riding enthusiasts will have the opportunity to attend seminars presented by experienced riders on what to expect at their first ride, care taking of themselves and their horse and many other topics. Day 2 is the actual CTR where an IDR and 25 mile CTR will be available. Stay tuned for more details. Autumn Gallop at Boggy Creek -Welcome back Boggy Creek! The 1st weekend in November brings us one of our favorite rides that is a fund raiser for a wonderful facility, Camp Boggy Creek. For those of you who think they may be ready…The FHA 100 will be held January 31 – February 3. Carol Thompson will be the ride manager this year and she has some great ideas up her sleeve. Stay tuned for details!! Have a ride you love going to and it’s not on our calendar? Tell me about it and I’ll reach out to the ride manager asking them to sanction with us. Ride managers – send me an article about your ride. Include pictures if you’d like. I’ll share in our newsletter which will also be seen on Facebook and the SEDRA website. Until next month, Happy Trails! The information found on the SEDRA Riding website, is provided for entertainment and educational reference only. 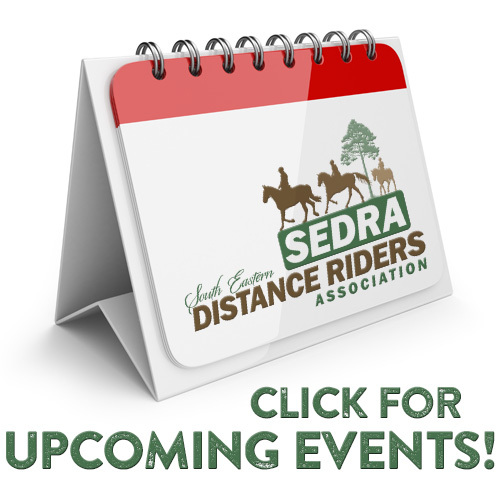 SEDRA Riding and South Eastern Distance Riders Association (SEDRA) does not specifically endorse or recommend any organizations, companies or individuals referenced on the SEDRA Riding website. SEDRA expressly excludes liability for any damage, loss or injury that may be suffered as a result of information or opinions expressed our website. SEDRA was established in 1984! We would like to thank all of the members and supporters who have contributed over the years to one or more of our special programs, volunteering, educational clinics and/or our trail preservation fund! THANK YOU for your much appreciated contributions and continuing support of the long distance riding sport! 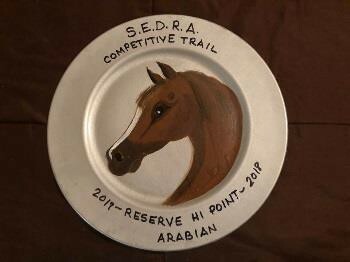 SEDRA, Inc. is a non-profit organization recognized by the Internal Revenue Service as tax-exempt under section 501(C)(3) of the Internal Revenue Code, donations to SEDRA, Inc. are tax-deductible.